Over 12 years ago, on my first trip to America, I discovered something strange. Americans were eating avocado in sushi. Then, about 10 years ago Japanese sushi restaurants began to use avocado. The idea came from the US! Avocado in sushi has been popular ever since. No.1: Dragon roll is made with cooked eel, avocado and sweet soy sauce on the top. I think cooked eel and avocado are a great match. No. 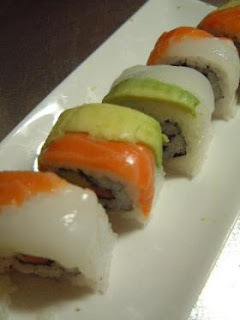 2: Rainbow roll is made with avocado (inside) and several kinds of sashimi on the top. The sashimi can include tuna, salmon, red snapper and others. These sashimi are very colorful and beautiful. No.3: Sunrise sushi is very rare. It is wrapped with tuna sashimi instead of nori (black seaweed paper). There is egg yolk from an “uzura” and tobiko on the top (“uzura” is a small chicken). The egg and tuna complement each other very well. I eat avocado with tuna sashimi now. It is a very easy recipe. Cut tuna sashimi and avocado into 1/2” squares. Put them into a dish and mix. Put sesame, chopped nori (black seaweed paper) on the top. Sauce is made by mixing soy sauce, wasabi and lemon juice. Put the sauce on top of the tuna and avocado. Salmon can be substituted for the tuna. I went to Ohio on a business trip. My customer told me he couldn’t buy any sashimi in his town. He enjoyed avocado with soy sauce and wasabi. It tasted very similar to good tuna sashimi. He enjoyed it instead of real sashimi. I do not know who started to eat avocado with soy sauce and cook avocado in sushi. The idea is great and a wonderful combination - Japanese culture and avocado! I welcome that kind of combination and will keep searching for it.